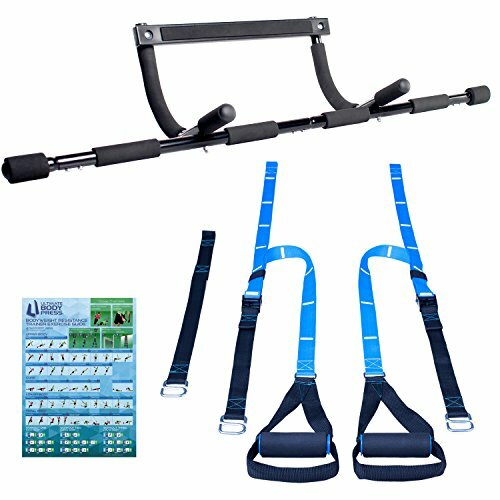 The New Pull Up Bar Bodyweight Resistance Trainer Package delivers complete workouts for fast results. Our expandable top quality Doorway Pull Up Bar adjusts to fit your doorway with no drilling required. All new Bodyweight Resistance Trainers add full body low impact compound bodyweight exercises with a host of assisted exercise variations so you can complete full pull up sets right from day one. Featuring extension bars for a range of door frames, sturdy solid steel construction and comfortable thick foam grips with additional padding for push up stand use, the Doorway Pull Up Bar supports your best fitness everyday. Pull ups engage groups of muscles across your upper body and down the chain through your abdominals builds lean muscle and spike your metabolism for rapid progress on the results you want. Bodyweight Resistance Trainers include suspension straps indexed for fast even adjustments, heavy duty cam buckles and high strength handles with integrated foot loops. Innovative Lay-Flat Handles and hardware layout follow body contours to prevent contact with buckles for workouts that promote optimum form. Anchor using your pull up bar, doorways, dip station, rafters, and park structures. Single point utility strap anchoring lets you workout in any location while independent quick-connect 'S' hook anchoring lets quickly connect to the Dip Station for fresh challenges with Ring Push Ups, Chest Flyes, Planks, Pikes and more. Comprehensive exercise guide includes 26 movements and 3 sample workouts.